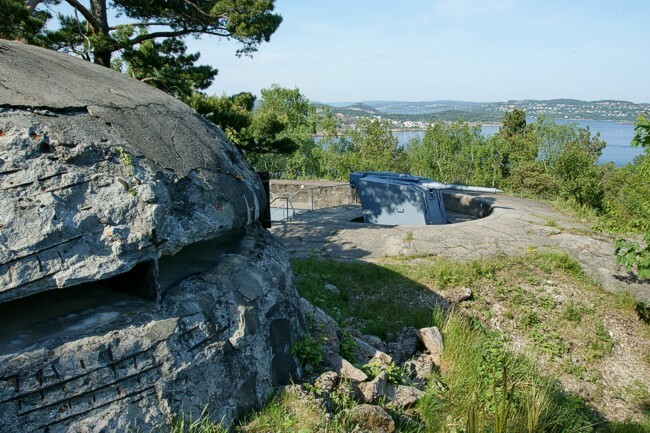 During the German invasion of Norway the enemy attacked the fort on the 9th of April 1940. In this fight the German civil steamer Seattle was sunk by the Norwegian artillery. The anchor is on display. Battery I had the 15 cm Vickers Amstrong L/47.5 guns since 1903. The information panel here states that the Germans removed them in 1941. The second battery was armed with French 21 cm K St. Chamond guns. The Germans placed them at Flekkerøya. In 1942, 24 cm H St.Chamond guns came instead. At battery III the wooden information panel is damaged, but we tried to decipher the information. The battery had the same 15 cm Amstrong guns than battery I. The Germans displaced them also in 1941 elsewhere. We also found out that the present German Flak guns were placed by the Norwegian army after World War II, "Etter krigen". This instruction plate on the gun could prove this theory. So the MSB Odderöy had only 2 times the 24 cm howitzer gun. The view on battery III.